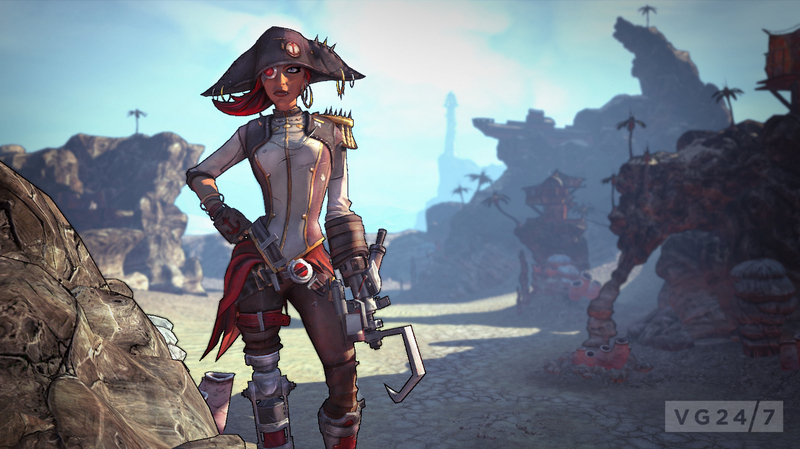 Borderlands 2 does pirates in its first expansion pack, Captain Scarlett and her Pirate’s Booty. VG247’s Dave Cook sets sail with a 50 Mechromancer in search of treasure. Ah Borderlands, you just love to take the piss out of pop culture don’t you? The series has already got zombies and ninjas covered, so pirates were naturally next up on the lampoon agenda. 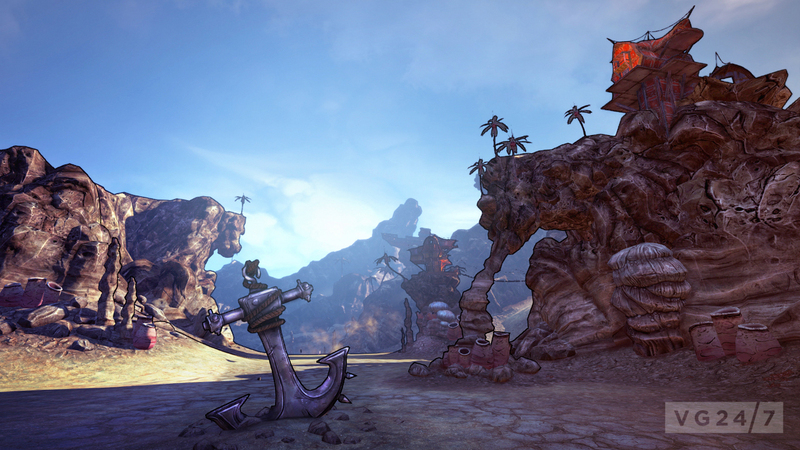 Enter Captain Scarlett and her Pirate’s Booty, the first DLC expansion for Borderlands 2, launching tomorrow on PC, PS3 and Xbox 360. It’s big, full of hilarious comedy, and best of all, is absolutely worth your money. See, what many games do now – thanks to how easy it is to push content out on digital platforms – is release small, incremental updates for games that come with unfair price tags. Not Borderlands 2 however, as this expansion hits the 8-10 hour sweet spot. Good times. Perfectly sending up pirate culture – can you call it ‘culture’? 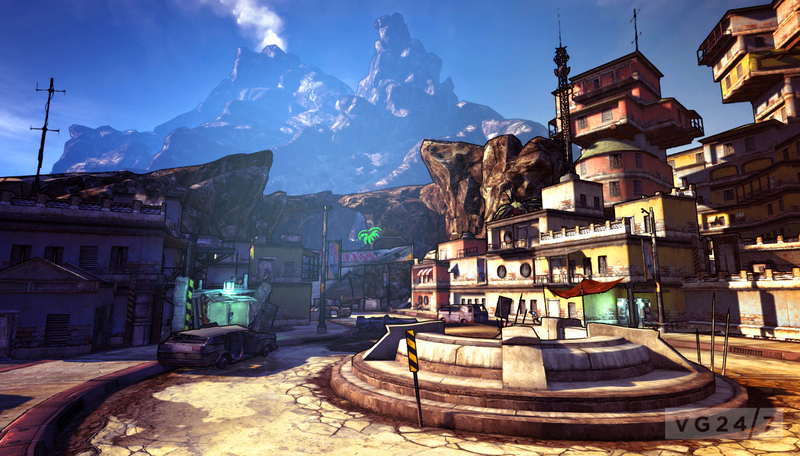 – the expansion follows the vault hunters as they travel to the northern lands of Oasis in search of buried pirate treasure. To find the booty, they must side with the dangerous Captain Scarlett, a legendary pirate who totally won’t betray you. 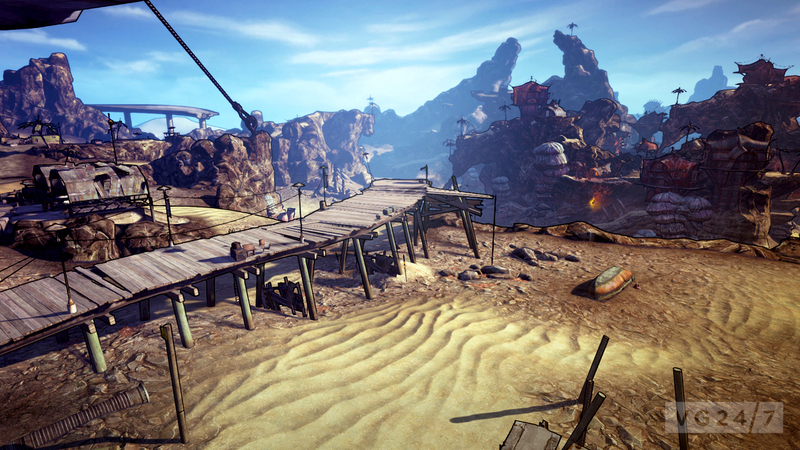 You can access the expansion at any point in Borderlands 2 via fast travel station, but as the enemies start around level 30, you really need to skill up a bit before heading to Oasis. Even with our level 50 Mechromancer, some battles caused us slight difficulty, and that’s saying something. 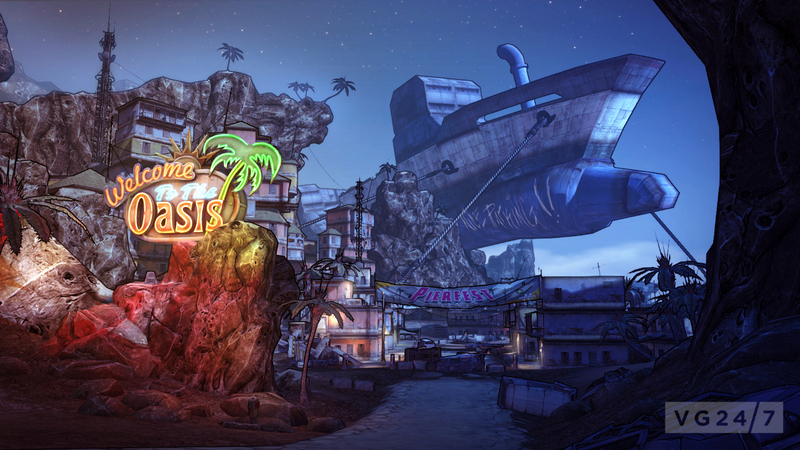 As you approach the village of Oasis you start to realise that – unlike many expansions out there – Gearbox has decided against re-using assets for the best part, giving new locales a fresh vibe. There are dried-up ocean floors, shipwrecked vessels and underground hideouts that look like something out of The Goonies. 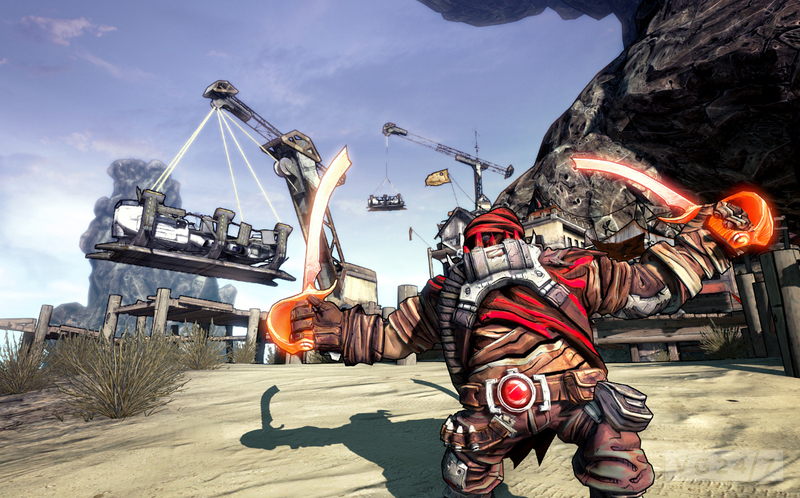 There is even a new roster of enemies that include ninja pirates, vicious sand worms and more. It’s nice to see real effort going in to DLC for a change. Oasis village is deserted, save for an odd fellow called Shade, who looks like a bobblehead of Hunter S. Thompson – sunglasses, hat and garish shirt intact. He’s gone mad through dehydration, and has crafted fake townspeople out of megaphones, wigs and clothing. One mission sees you gathering parts for the expansion’s new Sand Skiff vehicle. To get them you have to speak with with the town’s ‘residents’, and it’s instantly clear that Shade is doing all of their voices in an attempt to stay sane. It’s pretty damn funny, and smacks of classic Borderlands. What’s also neat is that for a pirate-themed expansion, there are no oceans to sail on, as they’ve all dried up. What you get instead are hover ships built to look like sea-faring vessels. 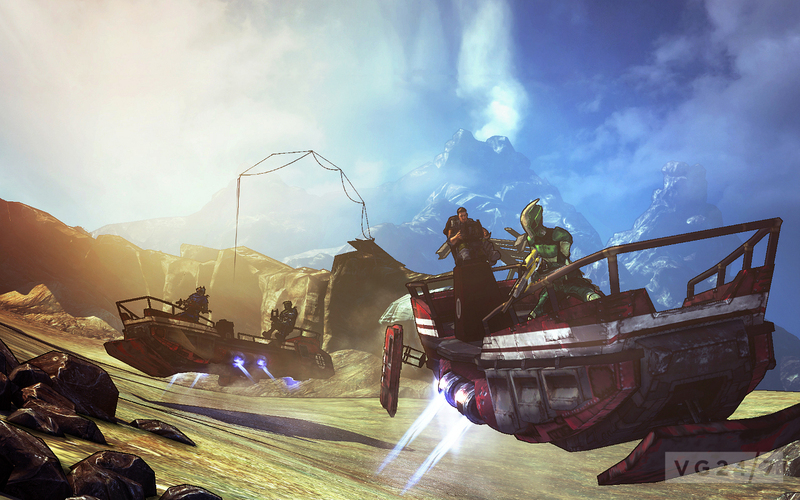 Your Sand Skiff can be summoned from any Catch-a-Ride station and it handles a little differently from other Borderlands 2 vehicles. It slides around a lot, and comes in three flavours, each with different weapon load-outs. It doesn’t take long for you to meet the titular Captain Scarlett, and she’s suspiciously eager to tell the vault hunters about a stash of treasure hidden by long-lost pirate Captain Blade. To find the spoils however, you have to help Scarlett find four pieces of a mysterious compass. Her old partner Sandman – who she totally didn’t betray – has the first piece of the device, and so you set sail – err, hovercraft – to find it. 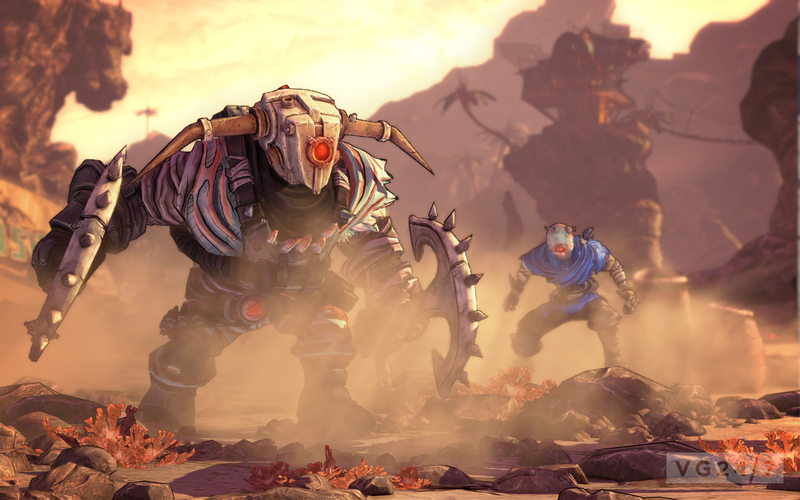 The mission structure is the same as the core missions of Borderlands 2, but new threats shake up the experience a little. You have Anchormen, big brutes similar to Goliaths that wield to rusted anchors, swinging them at you with force. These guys soak up damage and can knock you off some of the cliff areas around Oasis if you aren’t careful. Did we mention the DLC has ninja pirates in it? Because it totally does, and they’re weak as hell, which we’re sure must be another in-joke from Gearbox. There are also Buccanneers that dual-wield red hot swords, and more enemies to contend with. Sandman is the expansion’s first boss, but there are a few good encounters in there, including the stupidly named ‘No Beard’, and a hulking leviathan that lurks beneath the cracked ocean bed of Oasis. Well yeah, because we’re seen a lot of gamers out there who have already finished the core Borderlands 2 campaign, so this DLC couldn’t have been timed much better. Best of all, it really does add a decent wedge of game-time onto the clock. Perhaps the most important thing to consider here is that the locales, enemies and themes all feel quite different, shaking up the template of the main missions perfectly. Even if you are still doing the same fetch and kill errands as before, there is enough new content here to hold your interest. Plus, if you like pirates, ninjas, and all round comedy banter, you need look no further. Captain Scarlett in particular is a great character, constantly trying to hide her vindictive nature behind thinly veiled pleasantries. She also likes to make references to her hands over radio, and making gestures that you clearly can’t see over the airwaves. The way she catchers herself doing it and then explains her motions in great detail is hilarious. She’s destined to become a fan favourite. So there you have it: more guns, more badass and a ton of pirate booty. Let’s hope subsequent expansions are this good.